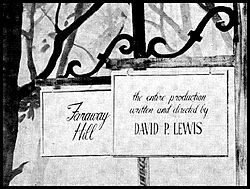 Faraway Hill was a soap opera that premiered on October 2nd, 1946 on the DuMont Network, and ended on December 18th, 1946. It was the very first soap opera broadcast on television. The show would involve a New York City widow named Karen St. John, who would move to a small city to be near her relatives. Here, she would meet a man who had been adopted by Karen's family. She would fall in love with this man, but he would have already been engaged with another woman. Also, Karen, a sophisticated woman, would sometimes clash with her rural relatives. Episodes of the series were made on a very small budget of $300. The series starred actors and actresses like Flora Campbell as the main character, Mel Brandt (not to be confused with Mel Blanc), Eve McVeagh, etc. The show was broadcast live. However, filmed parts were interspersed, and slides made of previous episodes were made to keep viewers in on what was happening in the show. An unknown announcer narrated Karen's thoughts as bridges between other scenes. As mentioned before, the show was broadcast live, which means no recordings were ever made. Recording was hard around this time, as kinescopes did not exist until 1947. Also as said above, there were filmed parts but these have not surfaced to this day. This show was also part of DuMont, the network that took itself off the airwaves in 1956, and destroyed many of their TV shows, possibly including filmed parts of Faraway Hill. If this is true, then Faraway Hill may be lost for good. The only visual evidence of the show left is a title card.